A melanoma can develop anywhere on the body, including places which do not receive frequent sun exposure, but may have been sunburnt. 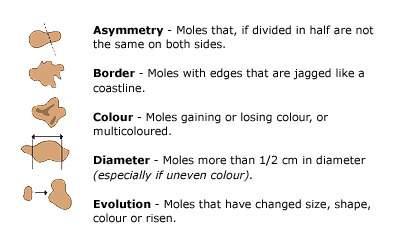 A melanoma is likely to have a similar appearance to a mole but unlike a mole, a melanoma will usually grow larger and become more irregular in shape and colour. Check your skin and moles at least every three months. The ABCDE rule is a useful guide of what to look for.